Spring is here! 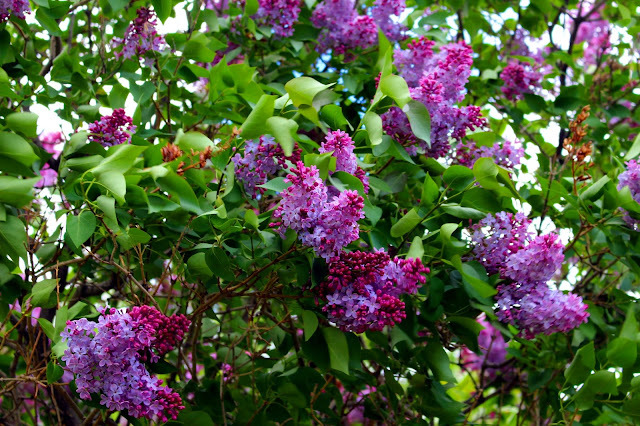 And so are my favorite flowers, lilacs! Purple has always been my favorite color so its fitting that I would have purple hair and my favorite flower would be purple. I have a huge lilac bush in my backyard so every year when the short lilac season comes around I take advantage of it. I swear these are a lighter purple IRL but isn't this color pretty too! This year I decided to up it a level by matching my cupcakes to lilacs. These cupcakes are soooo good! I know the peanut butter frosting sounds a little strange to have on velvet cupcakes and you can use the traditional cream cheese but I urge you to try this! The salty and creamy peanut butter frosting goes perfectly with the rich and dense velvet cupcakes. I've brought these cupcakes to a couple functions and they have been a crowd favorite.